Nourish and strengthen your thin, brittle or damaged hair while gently cleansing away impurities and toxins. 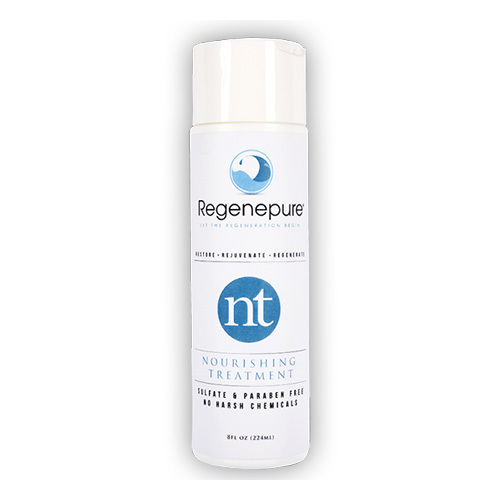 Enjoy natural conditioning and healthy, radiant results with RegenePure NT Hair Thickening Shampoo. Most shampoos contain harsh and damaging foaming agents that may make it seem like your hair is getting clean, but can ultimately damage what you want to protect. Nouris, repairh and strengthen your hair while gently cleansing away impurities and toxins. Enjoy natural conditioning and healthy, radiant results with RegenePure NT hair thickening shampoo. Most shampoos contain harsh and damaging foaming agents that may make it seem like your hair is getting clean, but can ultimately damage what you want to protect. But not RegenePure®. RegenePure® NT. This Shampoo promises to moisturize without stripping the hair and is gentle enough for daily use. Our special formula contains powerful, high-quality ingredients like Lecithin, Caffeine and Saw Palmetto extract that stimulate the scalp and hair follicles, as well as restorative nutrients like Niacin, Emu Oil and Glycerin. Your hair deserves only world-class ingredients. Everything we’ve put into RegenePure® NT will help keep it healthy, thick, conditioned and clean. For a complete description of key ingredients and their restorative properties, visit Regenepure hair care and hair vitalizing products website.